Isis (called "Aset" by the Egyptians), a daughter of Nut and Geb, is known in Ancient Egyptian mythology as a goddess of magic. Wife and sister of Osiris, Isis was originally considered a funerary goddess. After her resurrection via magic of Osiris, who had been killed by his brother Set, Isis was considered "more powerful than a thousand soldiers" and "the clever-tongued one whose speech never fails." She is sometimes invoked as an assistant in magical rituals in some traditions of contemporary Paganism. Her worship is also a focus of some Kemetic reconstructionist groups. Isis and her brother, Osiris, were recognized as husband and wife. Isis loved Osiris, but their brother Set (or Seth) was jealous of Osiris, and planned to kill him. Set tricked Osiris and murdered him, and Isis was highly distraught. She found Osiris' body within a great tree, which was used by the Pharaoh in his palace. She brought Osiris back to life, and the two of them concieved Horus. 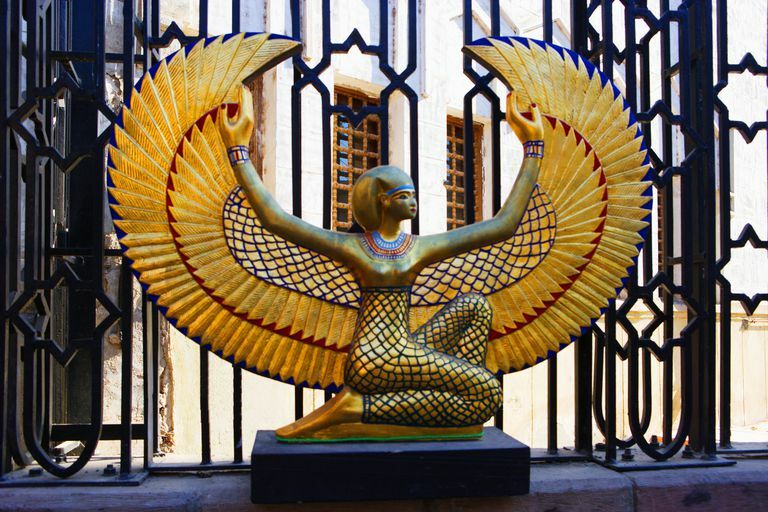 Because Isis' name means, literally, "throne" in the Ancient Egyptian language, she is usually represented with a throne as a depiction of her power. She is often shown holding a lotus as well. After Isis was assimilated with Hathor, she was sometimes depicted with the twin horns of a cow on her head, with a solar disc between them. Isis was at the center of a cult that spread far beyond Egypt's boundaries. The Romans were aware of the cult's existence, but it was frowned upon by many of the ruling class. The emporer Augustus (Octavian) decreed that worship of Isis was forbidden as part of his attempt to return Rome to Roman gods. For some Roman worshipers, Isis was absorbed into the cult of Cybele, which held bloody rites in honor of their mother goddess. The cult of Isis moved as far afield as ancient Greece, and was known as a mystery tradition among the Hellenes until it was banned by Christianity around the sixth century c.e. In addition to being the fertile wife of Osiris, Isis is honored for her role as the mother of Horus, one of Egypt's most powerful gods. She was also the divine mother of every pharaoh of Egypt, and ultimately of Egypt itself. She assimilated with Hathor, another goddess of fertility, and is often depicted nursing her son Horus. There is a wide belief that this image served as inspiration for the classic Christian portrait of the Madonna and Child. After Ra created all things, Isis tricked him by creating a serpent which ambushed Ra on his daily journey across the heavens. The serpent bit Ra, who was powerless to undo the poison. Isis announced that she could heal Ra from the poison and destroy the serpent, but would only do so if Ra revealed his True Name as payment. By learning his True Name, Isis was able to gain power over Ra. After Set murdered and dismembered Osiris, Isis used her magic and power to bring her husband back to life. The realms of life and death are often associated with both Isis and her faithful sister Nephthys, who are depicted together on coffins and funerary texts. They are usually shown in their human form, with the addition of the wings that they used to shelter and protect Osiris. A number of contemporary Pagan traditions have adopted Isis as their patron Goddess and she is often found at the heart of Dianic Wiccan groups and other female-centered covens. Although modern Wiccan worship does not follow the same structure as the ancient Egyptian ceremonies that were once used to honor Isis, today's Isiac covens incorporate Egyptian lore and mythology into a Wiccan framework, bringing the knowledge and worship of Isis into a contemporary setting. The Order of the Golden Dawn, founded by William Robert Woodman, William Wynn Westcott, and Samuel Liddell MacGregor Mathers, recognized Isis as a powerful triple goddess. Later, she was passed down to modern Wicca when it was founded by Gerald Gardner. Kemetic Wicca is a variation of Gardnerian Wicca that follows an Egyptian pantheon. Some Kemetic groups focus on the trinity of Isis, Orsiris and Horus and utilize prayers and spells found the ancient Egyptian Book of the Dead. In addition to these widely recognized traditions, there are countless eclectic Wiccan groups throughout the world that have selected Isis as their deity. Because of the strength and power displayed by Isis, spiritual paths that honor her are popular among many Pagans who are seeking alternatives to traditional patriarchal religious structures. Worship of Isis has seen a resurgence as part of the "Goddess-oriented" spirituality that has become a notable part of the New Age movement.